You may remember that not very long ago at all, we told you about what analyst Ming-Chi Kuo believed the iPhone 8 would offer if and when it goes on sale later this year. With rumors of an almost bezel-free display and certainly a front with no Home button to be found, the suggestion of a so-called “function area” at the bottom of the iPhone’s screen was discussed. We also posited that this may be used in a similar way to how Apple’s 2016 MacBook Pro makes use of the Touch Bar, and as a new concept shows, we were not the only ones. Apple is believed to be working on an iPhone that does not have a traditional Home button, with the Touch ID sensor and Home button duties handled by sensors beneath the device’s display. This would allow for the screen to expand below its normal limits within the iPhone’s frame, providing plenty of room for the aforementioned function area. Based on that, the newly published concept takes the MacBook Pro’s Touch Bar and repurposes it for use on an iPhone. The result looks absolutely gorgeous and without doubt opens up plenty of avenues for conversation on the subject. As the concept video shows, the function area could be used to house information and buttons that would normally not be available, or at least as easily available on a device with a traditional iPhone screen size and shape. If Apple is ditching the Home button as we know it, we’d love to see the iPhone 8 do something like this rather than simply give us another row of icons and more space for apps to live in. Come on Apple, let’s have something mind blowing here, please. It’s about time, we’re sure you’ll agree! Check out the full concept video below and see what you think about the potential here. 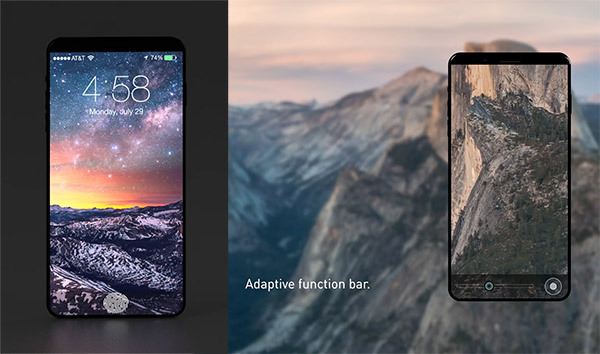 Best rendering so far, apple should really make this iphone. Maaan that’s a beautiful concept. I wish Apple thought this good if technology allowed them. Bezel less is what I want and please get rid of button. It should be buttonless too!